BEA Technologies manufactures filters and filtration systems for oil & gas installations and power generation plants. We are ISO 9001:2008 certified, and are able to meet any specific customer requirement via the use of our computer-aided design (CAD) system. Our facility in Pero, Milano, Italy, is where we carry out manufacturing, research and development, laboratory, sales and customer service, as well as management and administration. Our FILTROMATIC automatic backwashing system comes with a control system that allows the automatic management of regeneration cycles. The system is designed to filter water at high rates, up to 10.000 m3/h for 24h/24h without any stop, all year round. It is used with seawater, riverwater and wellwater when they are treated for cooling purposes in the power generation plants, chemical-petrochemical and steel industries, and comes with high and medium flow-rate capacity. 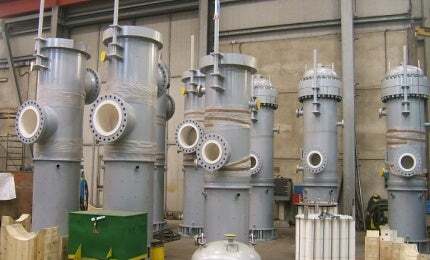 BEA manufactures gas filters, filter separators and absolute separators, which can be used to remove solids and liquids from natural gas streams to power generation plants. FLO-GAS filters are used to remove dry solids. They work by capturing large and small solid particles on the outer section of the filter with an efficiency exceeding 99.99%. These come in either vertical or horizontal shells. Gas liquid filter separators are used to remove solid particles and liquid residue from gas flow, and are built in a two-stage design. First stage is a pre-filtration stage with pleated cartridges and second stage is made with an high efficiency VANE-PACK to separate residual liquid droplets from gas. Gas filters and separators are regularly used in gas distribution and compression stations, and to protect mainline transmission systems, dehydration towers and desiccant beds. The BEA-GRANFILTER are characterized by high surface, up to 10 sqm for each element, to increase the retention capacity of solid particles and reduce the change-out operations which are costly and time consuming. The advantage is to use fewer filter elements and reduce the capital cost of housings to be used. The specific pleating configuration enables the filter to reach optimal flow distribution to fully use the entire filtration surface area, resulting in a longer service life and higher throughput. Granfilter cartridges work best even with fluids that have a high level of contamination. Used in refineries and petrochemical plants, the DUOMATIC self-cleaning backwash feed filter can be used to remove solid contaminant particles, and extends catalyst life by stopping solid particles from entering the catalyst bed. DUOMATIc is designed with a modular construction based on more housings working in line, to have only one housing in backwashing while others are in filtration. Only one housing is Off-stream for backwashing, which guarantee continuous flow to plant. Minimal quantity of product used during backwashing cycles.